Chinese New Year has started last weekend. I bet you ate a lot if you managed to celebrate CNY with your family as we did. We really need a light meal to get certain balance. So I cooked this Chicken with Mango and Roasted Almonds, that used fresh mango, adding a kick of roasted almond flavour. This dish was actually recommended by my friend SK. I owed her so much, gave me lots of Taiwanese basils she's grown, and this time passed me a large mango. No, it’s a very large, extra large mango from another friend who grows a big mango tree in her backyard. Once I went home, I weighted the mango. The net weight of it was 450 grams, only for the mango flesh. It’s very huge indeed. It’s a kind of Australian mango, named R2E2, very sweet and juicy. The texture of the pulp is perfect for stir-frying. Use a sharp knife to cut the mango lengthwise next to the seed into three parts (two halves and a middle part with the seed). Carefully cut parallel lines through the two halves of mango flesh down to the skin. Scoop out the flesh with a tablespoon. For the middle part, peel the skin and cut the flesh off from the seed. Then cut mango into strips, about 3.5 to 4cm in length. Or you might like to cut into cubes to your liking. Rinse chicken and drain well. Remove fat. Julienne into 3cm strips. Mix with marinade for 20 minutes. Place almonds in preheated oven at 180C (356F) about 10 to 12 minutes, or until fragrant. Make sure not to burn them. Let cool. Place in a plastic bag, pound into small pieces. Set aside. Heat 2 tablespoons of oil over medium-high heat. Stir-fry chicken until done. Turn off the heat. Add mango, quickly combine all ingredients. Dish up and sprinkle roasted almonds. Enjoy! You can cook this simple and delicious dish on the go. The key is to get really sweet and juicy mango. And the roasted almonds would bring this dish up to another level by adding very sweet fragrance, as well as crunchy texture. If you can’t get very sweet mango, you might like to sprinkle a small amount of sugar to adjust. My friend SK recommended slivered almonds initially. Unfortunately, I didn’t have any at home. Thus I roasted whole almonds and pound them into small pieces. If silvered almonds are used, just sprinkle over the dish after they are roasted. 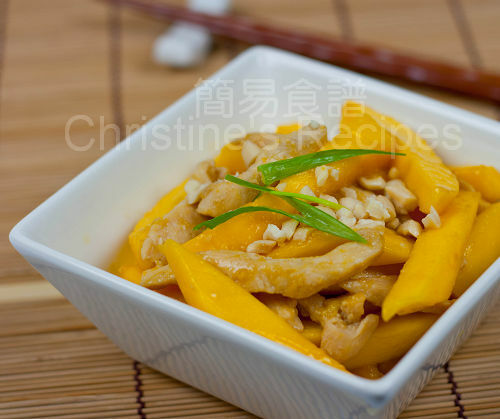 Wow, I've never cooked with mango and chicken together, but you've convinced me - this dish looks stellar. I hope you had a wonderful Chinese New Year. OMG, mango and almonds are two of my daughter's most favorite foods! I must make this for her right away! I am sure this is a refreshing dish after several heavy meals for the Chinese New Year, and I adore the idea of adding roasted almonds. The dish looks great.I need to start using mango in my asian dishes. It's readily availble. I love mangoes. What a good way to enjoy it as a side dish. I first had mango and chicken combo in HK, it was in a form of a pastry. I thought it was weird at first but I grew to like it! This looks and sounds so good! Happy CNY and gong hei fatt choy! 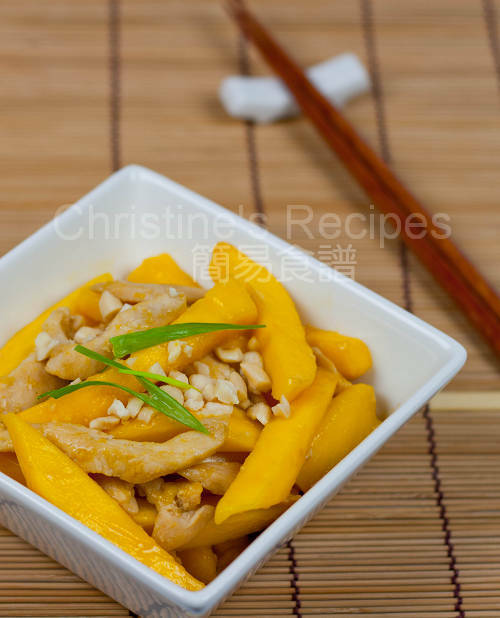 I adore the mangoes and I love to use them in preparing the stir-fry too. Yours looks scrumptious! Chicken and mango, this is a combination that I never had...love the idea! Looks delicious and fruity! Wahh! Mangoes and chicken. I must try this before the mango season disappear.